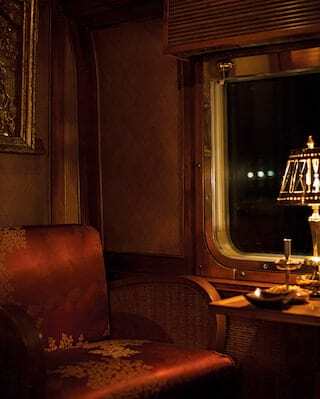 The fabled Eastern & Oriental Express brings the glamour, elegance and exotic scenery of the classic black-and-white movie era to life, in glorious colour. To step onboard is to step inside another world. VIEWED FROM THE OUTSIDE, the train’s gleaming exterior is breathtaking. Its handsome green and gold carriages bear the iconic insignia of the Eastern & Oriental Express—a hallmark of true distinction. Onboard, our interiors are nothing short of magnificent, evoking the atmosphere of the 1932 Marlene Dietrich film Shanghai Express. You’ll find cherrywood and burr elm panelling alongside exquisite fabrics. Expect Jim Thompson Thai silks, Malaysian embroidery and hand-tufted carpets. Equally captivating is the quality of light in Southeast Asia. 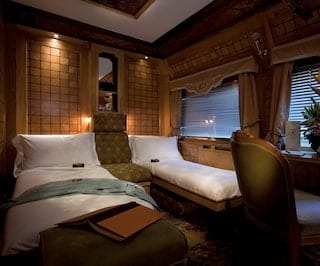 Golden and diffuse, it is best experienced from the train’s elegant open-sided Observation Car. Feel the breeze in your hair as you glide through lush green jungle and expansive tea plantations. You’ll see temples and ancient villages. Stops along the way include such storied sites as the River Kwai Bridge. There’s a certain magic to this voyage, feeling a great sense of adventure and at the same time completely relaxed. The Eastern & Oriental Express offers the best of the old and new worlds. In keeping with the golden age of travel, electronic devices are discouraged in certain areas. As for modern innovation, the train is beautifully air-conditioned so you can stay cool in the tropical climate. All our cabins have luxurious ensuite bathrooms. With its silk wallcoverings and upholstered armchairs, our Restaurant Car dazzles and delights. Understated elegance is key here, and guests like to wear light linens in the balmy heat of the afternoon. Evening attire complements our lavish dinners nicely—certainly, seeing fellow passengers in their finery can be a highlight of the trip. The train’s vibrant atmosphere lends itself to easy socialising; our piano bar is a favourite of new and returning guests alike. You might even like to accompany our resident pianist for a song or two. 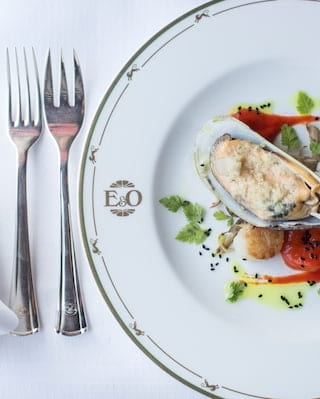 Such is the pull of this special train, many guests choose to bookend the Eastern & Oriental Express signature journey with a stay at the region’s most celebrated hotels, including the Raffles Hotel in Singapore. After all, the last thing you’ll want to do is hurry a journey that’s as unique and romantic as this one.